Johansen created his sugar skull light boxes through a paper-cutting process he encountered traveling in China. Paintings, like Incognito and light boxes provide commentary on humanity’s place within the environment. 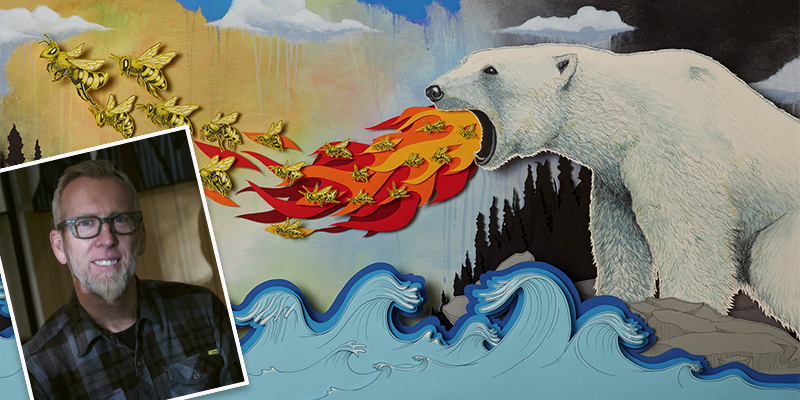 The mixed-media art of Leif Erik Johansen tells stories. Looking at work from the Weaverville-based artist, who uses materials including acrylics, oil, paper cutouts, pen, and glass, transports viewers to surreal landscapes, where bears fly through forests or men grow like islands out of the sea. For Johansen, tapping into such dreamscapes is what it’s all about: Inspired by surrealism and the illustrative style of artists like Ekundayo and Audrey Kawasaki, he was drawn early to the idea that art can be about anything. As a result, his work is populated by fantastic elements and bizarre-looking characters filled with authentic personality.